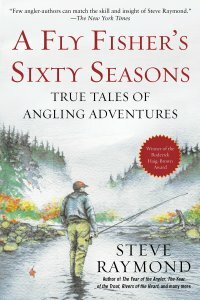 Steve Raymond returns with an informative and delightful collec- tion of memories, stretching over his sixty seasons spent fishing. Raymond takes the opportunity to write passionately about the full cast of his life, as well as how fly-fishing interacts with his life as a journalist, and vice versa. He offers sage advice about books, writers, rods, methods, and guides. He deftly ranges from joyful topics to bittersweet moments to a tongue-in-cheek quiz designed to test your fly-fishing sophistication. 6x9 inches, Hardcover.